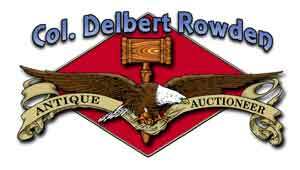 Delbert Rowden attended Missouri Auction School in Kansas City, Missouri, February 1975 and started out as a general auctioneer. Having developed a love for antiques he now specializes in the field of antiques and estate auctions. With a large library of antique books he does a lot of research on the antique field, specializing in glassware. Big D's Auction House was constructed in January 1999, the facility has 4400 square feet of space for auctions and banquets. The building has great lighting for display and showing off antiques to their best quality. We can display over 500 pieces of glassware in our forty feet of oak display shelving. Lockable china cabinets display small items. This temperature controlled facility has plenty of floor space for larger antiques and seating for your comfort. Very nicely decorated restrooms and a kitchen area with additional oak display shelving. The building has a cozy, unique, friendly atmosphere like our auction staff.